Thanks to innovative technologies and largely, the emergence of cloud storage and software, it’s possible to work from pretty much anywhere nowadays. When starting a small business or expanding into another location, the go-to can often therefore be to work out of a home office. 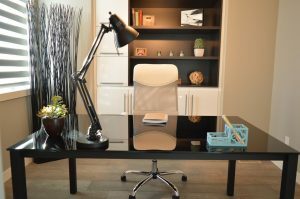 However, we need to ask ourselves the following question: ‘is working from home good for business or would renting an office space prove more beneficial?’ To help answer this, we’ve analysed the pros and cons of using a home office vs. rented office space to help you decide which option is the right fit for your business. Cut the Commute: Working from home completely cuts out commuting, eliminating any pre-work traffic stress and enabling you or your employees to dive straight into work once ready to start. No Long-Term Costs: There’s no need to sign a lease or pay any rental fees. The only additional costs incurred will be to kit out the home office space and the increase in lighting and heating bills as a result of being home all day. Business Impression: If you want to make the right impression with customers/clients, using a home address for contact purposes or meetings will not have the impact you desire. At the very least, you will need to hire office space for meetings and use a virtual business address. Lack of Structure: It can be very difficult to treat the home environment like an office environment and exert the same level of structure, focus and productivity to your work. It requires a lot of self-discipline – and understanding from family and friends too as they must also treat your home office like a workspace and ensure to keep disturbances to a minimum. Loneliness: A key reason why a home office can have a limited life span is that workers get lonely. Working from home 5 days a week brings with it a certain level of isolation. One of the best things about going to work is the social interaction with others, as well as networking opportunities. Appear Established: You will have a much better chance of winning clients and retaining customers if you are to have your own office space. Your own office and business address projects the image of an established business, a serious outfit – not just another “fly by night” company. Even in today’s digital world, a physical business presence is still an important factor for potential clients and customers. Stay Focused: Even in a shared office space, you will find yourself in the mind-set and environment to get to work and be productive, just like everyone else in the office. There will be no home or family distractions and you will be free to devote your sole attention to your work. Access to Amenities: Many rented and shared office spaces will come equipped with furniture and access to phone systems, printing services, private meeting rooms, conferencing and meeting equipment, perhaps even a receptionist – all of which ensure you are more readily able to do business and connect with potential and current clients. Financial Commitment: The biggest concern when renting office space is the financial commitment involved – signing and being bound to a fixed term lease, lighting and heating an office space, Wi-Fi costs, phone costs etc. The key is to find a rental office space offering that suits you – there are options beyond fixed long-term rentals with monthly rented office space, shared office spaces and all-inclusive rental office spaces being some of the most popular. Back to Commuting: The best rented office space for your needs and budget may mean the introduction of a city commuter, which means daily traffic stops and perhaps adding up to an hour to your working day. You will also have to consider whether there is proper transport infrastructure in place so that people can get to and from work easily. What are your growth plans for the next 12 months? How regularly will you need to meet face-to-face with clients? Do you intend on hiring employees soon? How structured do you need your work environment to be? These are all key questions you need to ask yourself.